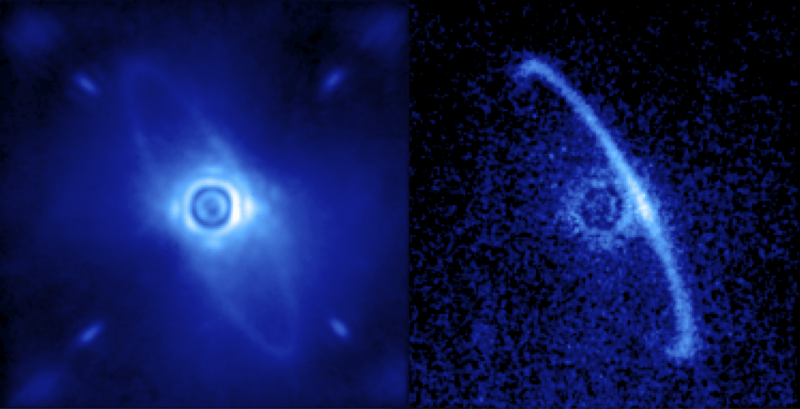 Stanford press summary: The first planet detected by the Gemini Planet Imager is 100 light years away but shares many of the characteristics of an early Jupiter. Stanford Physics Professor Bruce Macintosh, the lead investigator on the instrument, explains how this planet could help understand how solar systems formed. Of course, it’s not exactly like Jupiter. The planet is so young still has a temperature of 700 Fahrenheit, hot enough to melt lead. “In the atmospheres of the cold giant planets of our solar system carbon is found as methane, unlike most exoplanets where carbon has mostly been found in the form of carbon monoxide. Since the atmosphere of 51 Eri b is also methane rich, it signifies that this planet is well on its way to becoming a cousin of our own familiar Jupiter. “ said Mark Marley, an astrophysicist at NASA’s Ames research center. In addition to expanding the universe of known planets, GPI will provide clues as to how solar systems form. Astronomers believe that the gas giants in our solar system formed by building up a large, core over a few million years and then pulling in a huge amount of hydrogen and other gasses to form an atmosphere. But the Jupiter-like exoplanets that have so far been discovered are much hotter than models have predicted, hinting that they could have formed much faster as material collapses quickly to make a very hot planet. This is an important difference. The core-buildup process can also form rocky planets like the Earth; a fast and hot collapse might only make giant gassy planets. 51 Eridani b is young enough that it ‘remembers’ its formation.